Of course, all eyes will be on the continuing battle between Will Power and Ryan Hunter-Reay for this year’s IZOD IndyCar Series title. With a good run at Sonoma (and some really bad luck on the part of RHR), Power now leads by 36 points going into Baltimore. He’s largely expected to have a good outing here after last year’s dominant performance, and doing so would probably sow up the title for him. Will this be Power’s year? We’ll find out in short order. If he gains 13 points over Helio on the day, Helio will be eliminated. If he gains 18 points on Ryan Hunter-Reay, he’ll be champion. Helio Castroneves is only 5 points behind Ryan Hunter-Reay in the standings, and is still alive in the quest for his first-ever IndyCar title (see above). He finished a lap down in P17 here last year in a rough race, but figures to have a much better result in this so-far rejuvenating 2012 campaign. This could either be a weekend where Helio closes the gap heading into Fontana, or where his championship dreams fall short for one more year. As mentioned the other day, Bruno Junqueira will be jumping into the #67 car as a substitute for the injured Josef Newgarden. Sarah Fisher’s team is just out of the TEAM entrant standings right now, sitting in P23, 14 points behind Ed Carpenter Racing. If they can line up a good finish (or even their first Top 10 of the year), they realistically have a shot at squeezing into that all-important Top 22. Unlike Sonoma, there will be no delay in activating the push-to-pass overtake assist for drivers in Baltimore. With a total of 90 seconds available to the drivers and zero wait time, we should see usage more in line with Toronto and Edmonton. As always, just what sort of impact it will have on the quality of racing will remain up for debate. Will we see a repeat of 2011? The Baltimore layout is an absolute blast, and should be even more so with the chicane removed from the front straight this year. Still, this will be a street with some hard transitions, and we'll have to see if there are any last-minute tweaks again this year to ensure safety and good racing. After a huge hit in Sonoma, Sebastian Bourdais will be making his last IndyCar drive of the year, since he'll be out of the car for the finale at Fontana. We'll wish him well, as he's definitely still achy from the big impact. There's no doubt he adds to the talent level to the Series in a big way. After a race weekend at Sonoma with precisely ZERO Mazda Road to Indy action, USF2000, Star Mazda, and Firestone Indy Lights combine for what should be an explosive show. In USF2000, Matthew Brabham has a narrow 14-point lead over teammate Spencer Pigot, with Scott Anderson attending to inject himself into the conversation as well. The doubleheader of USF2000 races could do much to put this title battle into perspective. Meanwhile, in Star Mazda, our buddy (Alberta’s Own) Stefan Rzadzinki will return to the track once again, but the real battle is going to be upfront. Jack Hawksworth is leading Sage Karam by 41 points in the standings, and we’ll have to see if Karam can improve on his P2 finish here from last season. Karam can still catch Hawksworth, but his window of opportunity is closing. This should be a great weekend in perhaps the toughest INDYCAR ladder series out there. In Lights, rookie Tristan Vautier has hung in against Esteban Guerrieri, closing to only a six-point deficit with a pair of races to go. While the title fight goes down to the wire, a couple of additional entries bring the car count back up to 13. Emerson Newton-John returns with Fan Force United, and the amazingly-named Adderly Fong is entered for Brooks Associates. It should be a great weekend for those in attendance—and for those watching the tape-delay soon after. There are a few livery changes of note this weekend. Ryan Briscoe is back in his black, blue, and white PPG colors, while Dario Franchitti has the black-and-gold Lexar sponsorship on the sidepods this weekend. Marco Andretti will be back in his ever-popular Dr. Pepper colors, while Oriol Servia’s #22 will bear the yellow-and-white WIX Filters scheme. As Baltimore proved even last year with the old Dallara, this is a course that could see some very mixed results. Watch for how the Chevys and Hondas each react on the long straight here, and keep an eye on some of the smaller teams to shake things up near the top this week. It’s been a rocky road in the last year for the Baltimore event; there were unpaid bills from last year, and some doubts the event would make it a second year, but with Andretti Sports Marketing at the helm, it seems as if things have really settled down. The group behind last year’s race has paid off its debt, and it sounds like everyone is looking forward to a really amazing event. Is Baltimore sustainable in an event in the long run? Let’s sure hope so. It seems as if this race can really be a quality event in an area of the country where it would behoove IndyCar to have a solid presence. Having an awesome course layout doesn’t hurt matters, either. Enjoy your Labor Day weekend (if you’re in the United States), and let’s watch what happens as the setup for the championship finale plays out. We've seen him in this sort position before, you know. 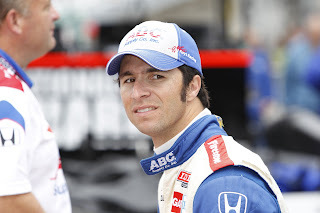 2009, in a Conquest ride, getting booted out at the last minute for sponsor considerations after squeezing a low-funded car into the Indianapolis 500. 2010, jumping in the car with only 7 laps of practice on another Indy 500 Bump Day, setting the fastest qualifying lap of the day in a second-weekend limited program car. 2011, qualifying solidly for the Centennial Year 500 in AJ Foyt's second car, only again to be replaced, this time by Ryan Hunter-Reay. Whether he's replacer or replacee, Bruno Junqueira is well-informed in matters pertaining to last-minute rides. Happily enough for Junky, this time he's the one doing the replacing. Really, that's been Junky's M.O. in IndyCar up to this point--one-off race attempts and jumping in a car on short notice and/or with a smaller team. This weekend, replacing an injured Josef Newgarden, Junky will be doing just that once again, this for Sarah Fisher Hartman Racing. Fisher's crew finds their #67 entry only 14 points behind Ed Carpenter Racing for the 22nd and final position for TEAM funding next year. The team, which has been quite fast at times but has yet to register a Top 10 on the season, can catch Carpenter's team, but there's no doubt the pressure is on. We last saw Junky in qualifying at Indy in 2011. We're used to seeing Junqueira on the ovals in IndyCar, but of course in his time on CART, he ran on all sorts of courses. Even with that being the case, this will be a big challenge, at a track layout he hasn't raced, with a small team that has plenty of potential, but few quality finishes on the year. Make no mistake, what happens this weekend for SFHR will have a big impact on their season next year. But hey, that's Junky's specialty, isn't it? Quite simply, do the most you can with the limited resources and time you've been given. The situation seems custom-made for him, really. As much as fans are disappointed to see Newgarden sidelined for Baltimore, it didn't take long for a laundry list of potential replacement drivers to be circulated. Alex Lloyd, Townsend Bell, Giorgio Pantano, Sebastian Saavedra, and Pippa Mann were all mentioned by fans as potential replacements, no matter how improbable some of those moves seemed. Still, it's hard to fault SFHR on their replacement choice. They needed a last-minute, one-off sorta guy, and they picked the driver with the right resume for the job. Fans remember Junky as the guy who handled difficult situations at Indianapolis in 2009 and 2011 with more grace than most of us could ever hope to summon. That's why I suspect he'll be a popular figure this weekend with the series die-hards, who have a strong sense of how justice should work in an ideal world (even if it rarely turnd out that way). If he manages a Top 10 for Baltimore, it will be a good chapter in the story of one of the best, unheralded "second-car" drivers of our generation. EDIT: I was reminded by several readers Bruno drove Baltimore in ALMS last year--my apologies, I had indeed forgotten. Thank you for the correction, and for reading! Sonoma: Was That The Championship? Lap 75. Ryan Hunter-Reay, still in the hunt for an IZOD IndyCar Series championship, was only a spot behind Will Power, and in line for a podium finish. Any damage to his title hopes on the day appeared to be minimized, as Ryan Briscoe was running ahead of Power and RHR. It was time for a restart, and perhaps one more chance to jump in front of Power, and gain some valuable points on the day--or at least stay in striking distance of Power going into the final two races of the season. Halfway through the restart lap, Alex Tagliani, looking to make a move of his own, spins Ryan Hunter-Reay. RHR can't get his car refired, and finishes a dismal P18, after Power comes home with another podium, and a 36-point lead over Hunter-Reay with two races remaining. Now, let's be clear: Will Power's lead is not insurmountable. Hunter-Reay is 36 points back; Helio is 41 behind his Penske teammate. That's the sort of lead that could be removed pretty quickly with a single disastrous weekend. Yet Power (who should be buying Tag's drinks through the end of the race season), has every reason to feel confident at the upcoming Grand Prix of Baltimore. Last season, he won the pole, the race, and had the fastest lap, just for good measure. And consider this: if we look at his performance on only street courses the last three years, he has a roughly a 62% chance of winning outright, and a 69% chance of finishing on the podium. That's unreal, and not just a little amazing. Make no mistake, I expect the last two IZOD IndyCar Series races to be two of the best of the entire season. I just wonder if Power has this in the bag, or if he will after next weekend. Essentially, if the series wants a true, close title fight for the season finale in Fontana, they have to hope for a bit of chaos in Baltimore. And if there's any justice in the cosmos (and there very occasionally is), Hunter-Reay and Helio will have some luck next weekend to tighten things up. Then again, this is IndyCar racing. As Ryan Hunter-Reay was reminded so cruelly on Sunday, all it takes is a split-second for an entire title fight to change. Think of Ana Beatriz and Will Power's sidepod at Kentucky last year. Think of Power sitting in his ruined car at Homestead in 2010, watching his titles hopes slowly fade with every lap he went down. Power will be on friendly ground, but he will need no reminders of just how fickle fate can be when it comes to titles. No, the championship hasn't been decided--yet. But for Will Power, he's one very good weekend away from clinching it. The Grand Prix of Baltimore loomed large before. Now, it could be the end of the road for Power's rivals--or yet another twist in a season chock full of the same. If there's a comeback coming, it will be one for the ages. Fans want one last giant battle to decide a championship between multiple drivers, and the 500-miler at Fontana could deliver just that. 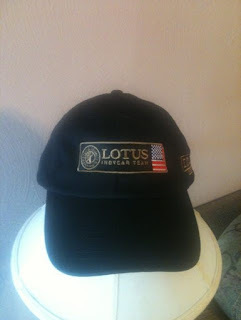 Perhaps Randy Bernard can somehow sneak a Lotus into Power's car for Baltimore. Failing that, we'll have to wait one more weekend to know for sure just what will be on the line at Fontana. Have a great weekend, enjoy Sonoma (don't forget to check out my 10 Storylines for the race! ), and we'll see you Monday. Now that IndyCar is ready to get back on the track, it's time for another installment of 10 stories to follow for this weekend's GoPro Indy Grand Prix of Sonoma. If you've slumbered a bit since Mid-Ohio, never fear; we're here to get you back in the swing of things. 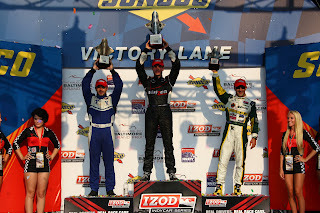 Going into Sonoma, there are four main legitimate contenders remaining for this year's IZOD IndyCar Series title. Will Power, Ryan Hunter-Reay, Helio Castroneves, and Scott Dixon are separated by a mere 28 total points. It is no exaggeration to say that a single poor race can doom the title hopes of a driver. Qualifying, and every position on track, will matter in a big way. The car count gets a boost this weekend as Sebastian Saavedra and Katherine Legge both return to the track: Saavedra in the #17 AFS/Andretti machine, and Legge back in the #6 TrueCar Dragon racing ride. Neither driver has had the season they'd hoped for (Legge in IndyCar, Saavedra mostly in Lights), so this will be another chance for each of them to make a good impression. How will they do? Saavedra is still learning. He's 22 years old--I look at this as much like a major league callup late in the season, to use a baseball analogy. Just get out there, give a decent accounting of yourself, and get some more experience. For Legge, we forget that she has far more road course experience than she does oval experience. This will be her first twisty in a Chevy, so it might be a better measure of where she is right now. After middling reviews for the push-to-pass system from Mid-Ohio, IndyCar is again tinkering with the formula for this weekend's race. The delay on PtP kicking in after being pushed in now 3.5 seconds, with 90 seconds total allowed for drivers. No more than 15 seconds in one spurt may be used. Will it do anything to enhance passing at Sonoma? We'll have to see. As of now, four drivers will be serving 10-spot engine penalties at Sonoma: Justin Wilson, Takuma Sato, Sebastian Saavedra, and Simona de Silvestro. There's never a good race for an engine change penalty, but Sonoma might be among the worst for it. Watch for the list to grow after Friday and Saturday's practice, as it usually does. If you haven't seen JR Hildebrand's San Francisco 49ers livery, it's worth checking out. Other changes include Oriol Servia in the TransSystems livery, complete with Salvador Dali on the sidepod; Tony Kanaan with Mouser Electronics as the primary sponsor this week; additionally, Josef Newgarden welcomes Angie's List back on the #67 this week. Sebastien Bourdais will be back in the TrueCar livery, which should match teammate Katherine Legge's. 6) Six In A Row For The Ganassi/Penske Bloc? 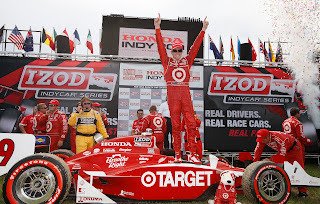 Dating back to 2007, either Chip Ganassi or Roger Penske's boys have won this race each and every year, for five straight victories. 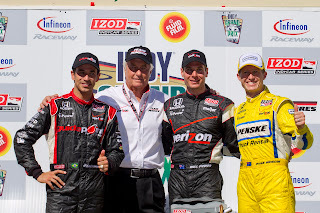 Penske and Will Power have specifically dominated since 2010, with Power leading a Penske podium sweep last year. With so much on the line, if the Penskes or Ganassis have another field day Sunday, it could shake things up in a big way. Ryan Hunter-Reay will have his work cut out for him, to say the least. The Penskes conducted a Sonoma sweep last year. Admittedly, Sonoma hasn't usually been a barn-burner of a course. Still, with Turns 7, 9, and 11 having been tweaked or moved, the early response from drivers seem to suggest we may be in for more passing opportunities come Sunday. Let's take this opportunity to admit it: Sonoma hasn't always been the most pass-happy of tracks--far from it, really. But we've said that of other tracks this year, and between a fresh Firestone tire compound, the workings of the DW12, and a closely matched driver talent, there very well could be much more passing on Sunday than in previous years. Charlie Kimball missed Mid-Ohio with his right hand injury, but he's back in the saddle once again for Sonoma. We'll see how he does in his return. I have to say Kimball has definitely grown on me with his performance this year. He's still a work in progress and still learning (as I'm sure he'd be the first to tell you), but he's had some very good races this season. Besides, I'm for any IndyCar driver getting that much sponsor activation. A lot people ask why IndyCar goes to Sonoma. If you want the most direct answer, it is simply this: the sponsors love it. Going to Sonoma Wine Country, where they can wine and dine clients in style, continues to be a big sell to sponsors. So long as that's the case, you can expect this course to stick around. Keep your ear to the ground this weekend, and you'll hear plenty about how happy the sponsors are to be in Sonoma this weekend. You’re right; I didn’t forget. Simona de Silvestro and Josef Newgarden each continue that search for at least a single Top 10 finish this season. It would be great to see Sarah Fisher Hartman Racing end the season with a string of good results, but right now, I believe most fans would settle for one good, start-to-finish, powerful Top 10 run. We know they can do it; it's just a matter of everything coming together for it. That’s three weeks of no IndyCar, enabled by a rather large, China-shaped hole in the schedule. I’m sure there’s some parallel here between negotiating a race with China and getting involved in a land war in Asia, but I’ll pass on that for now. What matters is, after what seems like a really, really long break, IndyCar is back at Sonoma this weekend. So what did we miss between Mid-Ohio and Sonoma, and how did we spend our time? -Some of us spent our time being taken out by Jacques Villeneuve in an extremely winnable NASCAR Nationwide race in Montreal. It could have been worse for Tag, of course. He could have had a really embarrassing day, such as throwing a shoe on the course, trying to defend the tattered remnants of Villeneuve’s driving reputation (still want to trash IndyCar, there, pal? ), or being spotted as having paid admission for what was little more than largely a wretched display of semi-skilled bumper cars. -Others watched various types of racing to try and bridge the gap. Of course, the Indianapolis Motor Speedway hosted MotoGP, Bryan Clauson won in some USAC action, and ALMS had an absolutely amazing race at Road America (someone please nab Martin Plowman a ride back in IndyCar). USF2000 also had their Road America event, which will be tape-delayed on Velocity. Watching and tracking these last two events, respectively, was a motivator in me praying once again that IndyCar figures out a way back to RA sooner rather than later. -More recently, some of us spent our time panicking, processing, approving, or denouncing the possibility a group of owners might be trying to purchase IndyCar. Honestly, though, it doesn’t sound as if anything concrete will come of it. I’m ok with that. I don’t mind the right owners talking about it, but this isn’t exactly a time where we need more turbulence or a leadership shakeup, in my opinion. -Still others began our dark mutterings and musings on the 2013 IndyCar silly season. Rahal, Sato, Barrichello….if you think negotiations and discussions haven’t already begun, you’re fooling yourself. We can expect 3-4 big moves, I’m thinking, but we’ve got a ways before any of that is announced. -Yet another group of fans (and I include myself here) began to experience severe withdrawal symptoms. Last weekend, I drove my son to Target to get a Pop-Tarts box with Scott Dixon’s picture on it (his favorite driver), and considered it a pretty big event. I was about a week away from painting faces on my IndyCar crash parts and holding a tea party with them. -Will Power, Ryan Hunter-Reay, Helio Castroneves, and Scott Dixon are in the thick of a very, very close battle for the IZOD IndyCar Series title. -KV Racing’s relationship with Rubens Barrichello seems a wee bit strained at the moment. The same could be said with Graham Rahal and Chip Ganassi. -A veritable host of different drivers and teams keep racking up podiums and Top 5s, but we’re still waiting to see if any of the smaller teams can pull a Coyne and win again this year. -USF2000, Star Mazda, and Indy Lights all have major title fights on their hands, which will all come into clearer focus in just a few weeks at Baltimore. -Charlie Kimball is ready to return to the track after the injury from his Mid-Ohio test. So, tanned, rested, and ready for action, the IndyCar faithful prepare to jump back into the culmination of an unpredictable season. If it’s all the same to you, if we can just cut out the summer break next year, that’d be awesome. Welcome back. I lost a shoe in Montreal over the weekend, so if anyone finds it, please let me know. IndyCar is thankfully back in action this upcoming weekend at Sonoma, but before we go there, I wanted to talk a bit about the action from USF2000 up at Road America this past weekend. Now, pretty much up to this point, no one has been able to catch the Cape Motorsports with Wayne Taylor Racing crew. Matthew Brabham and Spencer Pigot have been simply head and shoulders above most of the competition, and had won all but a single race heading into the Road America weekend. That single race that didn't fall to the Cape duo had gone to Belardi Auto Racing's Scott Anderson. Now, Anderson is a Skip Barber graduate--he landed in USF2000 this season thanks to winning last year's Skip Barber National Championship, and the scholarship that it came with. So he's definitely a product of the IndyCar ladder system. There's the idea that someone without a lot of money can still start at or near the bottom, and through hard work and on-track success work their way up. Frankly, it's been an elusive dream for a lot of racing series, regardless of size or type. Yet Anderson still has hope for the USF2000 championship, and the scholarship it entails for driver to advance to the Star Mazda Championship Series. Over the course of this past weekend's three USF2000 races, Anderson won the third race, finished on the podium in the other two, won a pole, and set a new track record while he was at it. With four races remaining, He's 50 points behind points leader Brabham, and only 36 behind P2 Pigot. That's a big gap, but its doable, especially if the Cape guys come to any more grief. It's worth noting Matt Brabham is now in the overall points lead, and he's looked consistently sharp this year. Make no mistake: if Anderson wins the title, it'll be against the odds. Anderson, in a lot of ways, is as good a story as they come. Of course, so are Matthew Brabham, with his family's rich racing history, and Spencer Pigot's working his way up through the open wheel ladder as well. Still, it wouldn't hurt one bit to remind everyone that Skip Barber is a valid road to IndyCar. Of course, one could surmise that simply by looking at the list of Skip Barber alumni, but every bit helps. Maybe Scott Anderson makes a charge and wins this thing. Maybe he doesn't. The fact that he's where he is, and at least in contention, is a good sign for the Mazda Road to Indy, and the hope of a healthy ladder that starts at the bottom and works its way up. USF2000 should have a fine finish to their year, and no matter who wins, you have to feel pretty good about the level of drivers we're starting to see make their way up the ladder. The Penskes had the points lead, with but one fuel stint left to play. A sickly silence fell upon the fans of Target's Famed. We'd put up even money, now, with Scott Dixon on the track. For there seemed but little chance for Scott D. to get past that. There was EJ twenty-second, and Jakes in twenty-third. For Dixon, mighty Dixon, was advancing up the track. There was pride in in Dixon's driving, and a smile on Chippy's face. No stranger in the crowd could doubt 'twas Dixie on track. While Robin Miller vainly searched for Dixie's wife to flirt. Defiance gleamed in Dixon's eye, as his Honda roared and ripped. "The time's not right," said Dixie. "Don't block," the race steward said. As they had in Indianapolis, when Sato's passing luck turned poor. And its likely they'd thought riot had not Dixon raised his hand. But Power once more blocked him, and then the white flag flew. But they remembered that the Iceman was not a man to screw. And they simply knew that Dixon would not let Power lead again. The distance closed between the cars; is it Dixon's check and mate? He's a nose ahead in fourth turn, as Power dives in late. And now the air is torn and tossed, and watch the flagman throw! But there is no joy in Cali - mighty Dixie has crashed out. I was sorry to hear of the passing of Jerry Grant yesterday. I never saw Jerry race, but he’s kept a prime spot in Indy 500 lore all these years from his terrible luck in 1972 with 12 laps to go. Pitting with a punctured tire while leading Mark Donohue, he pitted in teammate Bobby Unser’s pit, which resulted in a protest. With his last dozen laps disallowed, he finished 12th instead of 2nd. It’s the sort of story made for reminiscing with the old-timers over coffee in May, or bringing up on the Talk of Gasoline Alley. Grant came close to winning Indy in '72. 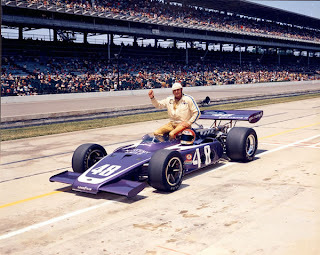 It would be easy to look at Grant as another late 60s-70s midpacker at Indy if you didn't know much about him, but the truth is, he did far more. You might recognize him as the first driver to turn a 200mph lap in an IndyCar, doing so at Ontario in a Mystery Eagle back in 1972. He also came close to winning the 12 Hours of Sebring in 1966, being disqualified only when Dan Gurney pushed the car across the finish line after it blew its engine a mere minute before the race’s end. Maybe fast laps and “almost wins” are sometimes just footnotes when we look at open wheel racing’s history, but they’re also part of what gives it depth and meaning. Jerry Grant qualified for Indianapolis 10 times, bridging a gap where revolutionary changes in cars were a yearly occurrence. His first 500 featured Jim Clark as winner; in his last attempt, he failed to qualify along with a young rookie named Rick Mears. He was a well-respected driver, and seemed to be a part of some of the strangest chapters in racing. Yet beyond that, it seems as if he raced just about every type of car at one point or another, from USAC to NASCAR to Can-Am and much more. In a Forbes interview in 2003, Jerry Grant seemed acutely aware of how close he had come to winning Indianapolis, and just how unfair his hand may have been. Whatever he may have felt about his place in racing history, there can be no doubt there’s certainly one for him in its pages. -By now, it seems like everyone and their cousin has weighed in on the Jay Penske arrest. Now, I'm not saying urinating on a woman's shoes is anything to be proud of, but when you've grown up on stories on the drug culture and arrests that permeated the racing scene throughout the 80s (the Whittingtons or John Paul, anyone? ), stuff like this does tend to pale by comparison. If anything, it shows our crimes in IndyCar are much more highbrow. Getting arrested for breaking and entering or public urination outside the Gulp n' Go is one thing--being busted outside a yacht club clearly shows some refinement. What will the impact on Penske's team be? Negligible, I imagine. It's embarrassing, yes, but I sincerely doubt we see any on-track ramifications. Additionally, I'm happy to see TMZ continued the national media's proud ineptitude when it comes to racing knowledge and identified Roger Penske as a NASCAR legend. For this story, I think we can let them have this one. I wish I could say I was lying when I relate to you the package showed up one day later than expected. -I didn't see a whole lot of discussion on this, Fontana's 500-mile season finale now has a title sponsor in MAVTV. That's definitely a happy sign; even happier is the indication it's part of a multi-year deal. Lucas Oil as a presenting sponsor doesn't hurt one bit, either. That's a good piece of news, and one I hope gets repeated for others tracks soon. If you’ve missed the action in the Star Mazda Championship this year, you’ve missed some of the most competitive, challenging racing in the entire Mazda Road To Indy ladder. Sage Karam knows that for a first-hand fact. With five races remaining on the Star Mazda schedule, the 17 year-old driver from Nazareth, Pennsylvania has charged his way up to P2 in the Star Mazda standings, only 41 points behind frontrunner Jack Hawksworth. He’s either won or finished on the podium in six of the last seven races. A year after being the Star Mazda Rookie of the Year, the driver of the #88 Comfort Revolution/Andretti Autosport machine has injected some life into Star Mazda’s battle for the title, and the Indy Lights scholarship that accompanies it. For Karam’s part, he believes winning that championship is possible. “I definitely believe I have a legit shot,” stated Karam in a recent interview. “I need to keep doing what I do, and no more mechanical breakdowns. I don't wish poor results on my opponents because I believe in that whole Karma thing you know? But, I certainly could use some help from the rest of the Star Mazda field”. With challenges remaining at Baltimore, Mazda Raceway, and Road Atlanta, Karam believes his aggressive approach on the track will serve him well as he continues to challenge Hawksworth and the rest of the field. “I have been driving with the ‘gloves off’ approach and I don't plan on changing that,” Karam affirmed. “Senna said, ‘when you see a gap and don't take it, you are no longer a racer’; I live by that. My team is excited about our success, the momentum and my driving style. I'd like to think that my team thrives off the excitement and effort that I bring to the track, and I feed off of their dedication, too”. There’s certainly been far more to cheer than regret for the Andretti Autosport crew this year when it comes to Karam’s on-track performance. “One proud stat I have to share is that we have only been passed this year in racing one time, and that was the first race of the year at St. Pete. I got punted once at Barber, but that doesn't count as legitimate in my book,” Karam laughed. “Of course, my car didn't roll off the line at Toronto, but under racing, only one pass. That's the stuff that championships are made of...at least I hope”. With five different winners and nine drivers already taking home Top 3 honors this season, Karam recognizes the brutal level of Star Mazda competition, from Jack Hawksworth on down. He deferred on stating just what made Hawksworth in particular such a strong competitor, but instead offered praise for the field as a whole. Karam also won at Iowa earlier this year. “Good question, but I will leave that one to you guys to answer!” he replied when asked on Hawksworth’s strengths as an opponent. “In all seriousness, this is a very strong Star Mazda field with a lot of depth. Jack's bad luck hasn't been as bad as my bad luck. One of the things about racing that I respect is that in order to win, you have to beat everybody that shows up, not just one opponent. Winning is a big deal--you ever watch that Juncos [Racing] team when they win? Those guys go nuts, like they won the Lotto or something. They know how to celebrate crazy! It's because winning is just so hard in this series”. After claiming his last victory (and first Star Mazda win on a road course) in the soggy environs of Trois-Rivieres, Karam admitted he wouldn’t mind seeing a few more races take a wet turn. “I think my karting background has been a major player in my car control and the comfortable feeling I have in the rain,” Karam asserted. “Wet racing is something that has always suited me from karting to cars, I can't explain why. So, yeah, I wouldn't mind if it rained every race, but it makes a mess of the car”. Whether he manages to win the Star Mazda Championship or finishes elsewhere in the standings, there are some big decisions coming for precisely where Sage will spend 2013. While he’s only in his second year of Star Mazda, there’s certainly some pull to look towards the next step of the ladder in Firestone Indy Lights, as well. “Winning the Mazda Road to Indy scholarship certainly makes the decision very easy,” supplied Karam. “Although it's a lot of money in my humble world, getting 2nd place prize money really does nothing to assist the move up to Lights. My first priority is the current Star Mazda program. Moving up to Lights next year is where my heart is, but I don't make those decisions. If staying down in Star Mazda is the plan, then that's what it is. I'd hate to think that my dream career would be over if I don't win the title this year, but I guess anything is possible and I have been taught to never take things for granted. I am surrounded by some amazing people and I feel that the important decisions are in the correct hands that have permitted me to focus on racing”. Additionally, Karam wouldn’t mind branching out in terms of his racing résumé, but so far, the opportunities haven’t been there. He’d “really like to race some sports cars in ALMS or Grand Am”, but feels he “just doesn’t get taken seriously” because of his age. Indeed, it’s difficult at times to remember Karam is still in high school. Off the track, he still attends school, and participates in one of his other passions, wrestling. “Wrestling and racing work nicely together for me,” mentioned Karam when asked about his wrestling pursuits. “The mental toughness that wrestling brings to the racing circuit is a huge advantage. When things are going well in racing or wrestling, I don't think much about the other sport, but when times are tough and I have to deal with a setback, I often ask myself, how would I handle this in racing or wrestling? A lot of physical training for wrestling and racing is very similar, believe it or not. So, it's like a year-round deal for me, for fitness. While the Indianapolis 500 remains a couple of steps down the road, Sage Karam certainly has no end of racing excitement to keep him busy this season. Whether or not the young American talent wins the Star Mazda Championship’s top honors remains to be seen, but he should do his part to make it an exciting dash to the finish. -I was sorry I wasn't able to make it to Mid-Ohio Sunday to watch the Honda Indy 200 in person, but I was pretty happy with the on-air coverage. Especially in the first half of the race, it seemed like it was a continual stream of information coming from the NBC/ABC broadcast, and there was plenty to keep tabs on. Even as the field became strung out over the duration of the green flag race, I thought it was definitely a step or two above the normal Mid-Ohio race we normally see. Cheers to the drivers and DW12 platform itself for making that happen. -With NASCAR at Pocono under a rain delay, I saw the normal encouragement online for our NASCAR cousins to switch the channel and check out some IndyCar action. I'd like to think a few did, but I believe for a sizable contingent of the fandom, road racing remains something they aren't precisely interested in. That's not a knock, but perhaps just how it is. It's a shame, because I firmly believe IndyCar has had the best racing in the entire nation this season (and if that doesn't get me at least 1-2 cranky emails, I'm not sure what will). With that, though, I'd like to send my sympathies and prayers to the family and loved ones of the fans struck by lightning yesterday at Pocono. That's just an awful turn of events, and I know the entire racing community has them in their thoughts. -So, with a mere triad of races left, we see Will Power again in the lead, with Ryan Hunter-Reay, Helio Castroneves, and Scott Dixon all following closely behind. There's been no artifice to this championship fight--both Power, Dixon, and Hunter-Reay all with five Top 3 finishes on the year. To me, that's about as even as it gets. Just four top drivers fighting it out, scratching and fighting for every point. -On that point, it was tough seeing Ryan Hunter-Reay drop like a rock through the field with a sick engine. He did his best with the Andretti boys to keep it out there, but in the end, a promising race turned into the occasion of losing the championship points lead. Still, it was a noble fight. -Is it just me, or is free-agent-to-be Graham Rahal not pulling any punches when it comes to his dissatisfaction with team performance? I have to think things might be just a little strained between Chip Ganassi's gang and Graham. RHR fought a valiant, but losing battle with his engine. -I wasn't just impressed with the drives of guys like Simon Pagenaud and Tony Kanaan, but also that of Giorgio Pantano, who moved up nicely through the field. It's even more impressive when you consider it was his first experience in the DW12 and his first Mid-Ohio race. It'll be nice to have Charlie Kimball back in the lineup, but I'd sure like to see Pantano get a few more chances now and again. 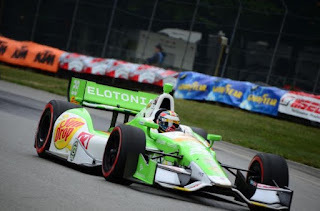 -I really hope Justin Wilson and engineer Bill Pappas continue their partnership next year. There's no doubt that partnership can produce speedy results. I remain convinced that Dale Coyne's team can contend for wins in this series with that duo. -Now we enter into the Doldrums. We have an interminable three-week delay until the next race, courtesy of the cancelled China venture. That's hurtful in terms of momentum, certainly. When we resume, however, we'll have three races in under a month to decide the IZOD IndyCar Series title. That's going to be a whirlwind, for sure. -Has qualifying ever meant as much to a championship battle as it will for Sonoma? If there's one track where I want to qual towards the front this year, it's that one. -It's nice to hear Katherine Legge is in a car for Sonoma, but the deal I'd heard a month or so ago had suggested Baltimore would be in play for her as well. It sounds as if that's not the case, but two races to close out the season are better than none. -Another race and--you guessed it--Josef Newgarden and Simona De Silvestro are tied with zero Top 10 finishes on the year. Newgarden had a pretty good race to finish P12, but Simona faltered after looking surprisingly strong in the opening laps. -One more note on Mid-Ohio: this was the first engine company-sponsored race that was actually won by a car affiliated with the sponsored company. Chevy had won all previous Honda-sponsored events, and a Honda won Chevy's Detroit race. -I've started working on my silly season projections for next year. I don't think we'll lose anything substantial in the way of car count, but I sincerely doubt we'll see a whole host of seats added. It's early on, but my best guess would be 25-27 full-time rides. They'll be plenty more to come on that, for sure. -How about the Firestone Indy Lights battle? Headlining Trois-Rivieres this past weekend, Lights saw their championship battle tighten greatly. Just a few races ago, it looked as if Esteban Guerrieri would be soon locking up the Firestone Indy Lights title. Now, with Tristan Vautier winning in Quebec, he trails Guerrieri by a mere six points with two races left. Gustavo Yacaman (P2 this weekend) has made it interesting, but along with Sebastian Saavedra (DNF), has no shot remaining at the Lights title this season. Vautier or Guerrieri...someone's getting a scholarship and a chance in IndyCar for 2013. I can't wait to see this fight when it picks up next month. -Meanwhile, in the Star Mazda Series, it seems more and more likely Jack Hawksworth will be this year's champion, but Sage Karam isn't making it easy. He's closed to within 41 points of Hawksworth after splitting the weekend's races with him. Realistically, Hawksworth makes so few mistakes, it makes it difficult for anyone to catch him, but Karam has really picked it up this year. Honestly, you could throw the Top 5 in this series into Lights next year, and I'm thinking they'd acquit themselves quite well. -USF2000 has been dominated by Cape Motorsports With Wayne Taylor Racing this season, but Belardi Auto Racing's Scott Anderson put an end to that in the second race of the ladder series' weekend schedule. I still think Spencer Pigot has a 2013 Star Mazda scholarship with his name on it, but the fact remains there are a number of very sharp drivers on the initial rungs of the Mazda Road to Indy. Giorgio Pantano looked plenty sharp at times last year, and his chats with Ganassi during the offseason make it not much of a surprise that he’ll be filling in for the injured Charlie Kimball this weekend at Mid-Ohio. Kimball had a good race there last year, and it’s a shame to see him out of the car, but hopefully he recovers quickly to finish out the season. In the meantime, Pantano should be fun to watch on this course. When is the last time Mid-Ohio enjoyed such a potential impact on the championship points standing? Ryan Hunter-Reay is 23 points ahead of Castroneves in the standings, with Will Power only 26 behind and Scott Dixon still in contention with a 61 point deficit. James Hinchcliffe is still technically alive in the championship, despite being 86 points down, but anything short of an epic string of races (or failures by the three aforementioned drivers) probably dooms his fading title hopes. Mid-Ohio is a chance for Hunter-Reay to either pad that lead, or see it fall to pieces (don’t forget, history says he’ll be trailing Power by a few going into Fontana, so it’s a safe bet we’re in for plenty of drama). Really, though, Mid-Ohio has been one of Scott Dixon's best tracks. And that's just the sort of thing he needs to hear, because if he has a poor finish from here on out, it could very likely be the end of his title hopes. Dixon owned Mid-Ohio once again last year. Fans who prefer NBC Sports Network’s on-air talent and producton will be in luck this week, as NBC’s Olympic coverage and ABC/ESPN’s NASCAR obligations create a perfect storm. The result? An ABC broadcast with an NBC Sports crew. It’ll be a rough go this weekend against the Olympics and the like, but hopefully there’s a solid broadcast for fans who might usually miss out on the excellent NBC Sports crew. We're still a couple of months away from true IndyCar free agency, but don't think the first shots haven't already been fired. With news Graham Rahal is likely moving teams at the end of the year, there's an entire list of drivers and teams with large question marks as to where they'll end up in 2013. Don't doubt for a minute that a lot of next year's groundwork is already being considered. It certainly gives the closing races of 2012 a bit of an audition feel. 6) Can Taku Keep It Going? After his P3 at Sao Paulo earlier this year, Takuma Sato finished P17, P22, P20, and P22 in his next four races. In a very uneven season, he'll look for to continue his momentum after the best result of his IndyCar career at Edmonton. Taku finished P4 here last year, and could be a dark horse to follow over the weekend. If you read Wednesday's interview with Alex Tagliani, there's a very good chance you'll be cheering for Tag and the Bryan Herta Autosport crew this weekend to finish what they started in Edmonton. The team is qualifying and placing well right now more often than not, and it should be fun to see if they can continue to build on that. I’ve been obsessed with this one since I first noticed it. 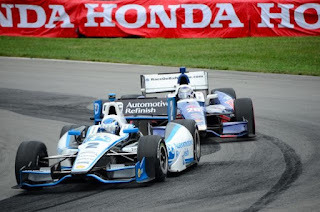 In the hyper-competitive field we have in this Year of Our Lord 2012, only full-time drivers remain with nary a Top 10 finish to their name: Simona Des Silvestro (fighting with half a car tied behind her back), and Josef Newgarden (so very, very close several times). Smart money is on Newgy getting it done first, but we’ve been surprised before. Is this the week it happens? That’s right, Firestone Indy Lights will be feature in Quebec’s Grand Prix of Trois-Rivieres. Two weeks after Carlos Munoz notched his first win of the season for Andretti Autosport’s Lights effort, Esteban Guerrieri maintains 27 and 28-point leads over Sebastian Saavedra and Tristan Vautier for the championship, respectively. Gustavo Yacaman is 56 points back, and in all likelihood needs a monster weekend to stay alive in the championship hunt. Lights won’t be alone in Quebec, either. Over in Star Mazda, it’s been all Jack Hawksworth, all the time, with the young English driver up 49 points over his nearest competitor. The American trio of Sage Karam, Gabby Chaves, and Connor De Phillippi all still have hopes of catching him, but honestly, J-Hawk has the look of a champion right now. Unless something changes big-time, and soon, Hawksworth looks to be the recipient of an Indy Lights scholarship in 2013. Further, after what seems like a scheduling hiatus of 17 months (it's actually been since the end of May), USF2000 returns to the track as a support series at Mid-Ohio this weekend. Cape Motorsports teammates Spencer Pigot and Matthew Brabham are 1-2 in the standings, with Belardi Auto Racing’s Roman Lagudi some 32 points behind the duo. No one has been able to stand against Cape this season, but Lagudi’s been the closest (next closest driver? Fully 28 points behind Lagudi). Further down the standings, Thomas McGregor, Matthew DiLeo, Scott Anderson, and Shelby Blackstock will work to shake things up. I can’t let a week go without some stats, can I? Here’s a fun one for you. Only six full-time drivers have not led a single IndyCar lap this season. Some of their identities, though, might surprise you. You’d be right in guessing Simona De Silvestro hasn’t led a lap, but she’s hardly alone. Sebastien Bourdais, Ed Carpenter, Mike Conway, Josef Newgarden, and Oriol Servia have all officially led 0 laps. James Jakes has led a single lap. Rubens Barrichello and Charlie Kimball have only led three apiece. One of the most interesting stats belongs to Tony Kanaan, who has led a mere seven laps on the year, yet sits P6 in the standings. As Dan Wheldon showed us in 2011, though, it doesn’t matter how many laps you lead, so long as you lead the last one. It sounds as if I’ll be heading to Mid-Ohio for my last event of the year (I’d love to make Baltimore, but the ol’ checkbook says no, I think). This will be an old-school, quick n’ dirty, leave-at-3AM sort of dash to the track. Hope to see some of you there! The first thing you notice about Alex Tagliani is that regardless of the subject matter, he's going to embrace it with a sort of enthusiasm and passion that make us more sedentary types exhausted by mere proximity. Tag seems to save his deepest passion for when he discusses racing, and in his 13th major open wheel season, he's found quite a bit to be excited about in his partnership with Bryan Herta Autosport. In a wide-ranging interview this week, Tag sounded off on a whole host of topics, from his experience with BHA, the fun he's having with this program, his history as a driver, the transition from Honda from Lotus, and much, much more. "It's not a goal to give a headache to the bigger teams; I think right now what's really nice is the new car regulations and rules is allowing for a lot of teams to be competitive. There's always a bit of an advantage if you could have more money, but it's not as big as we've seen before. The big advantage is still when you run multiple cars. Getting the setup right on the head the first time out is sometimes difficult. Multiple drivers, multiple cars, multiple engineers, give you more chances give you more chances to work over the same time and schedule to try many more things and more chances to get it right". "We've been lucky enough with the Lotus thing--we kept at it with a lot of intensity. We never threw in the towel or gave up. With the amount of work we needed to do--especially when you could just say 'we're not as competitive'--the team really tried hard. I mean, I tell you, there were times when there was no light at the end of the tunnel, but we never approached the race weekend with that philosophy. So when we finally changed engines, it made us good right away. We went onto Detroit as our first street course with Honda, and we qualified third. I mean, I was impressed myself, qualifying right there with Scott [Dixon] and Will [Power]. Then, at Toronto, we made it again in the Firestone Fast Six--that was our second in a row--and then in we did it in Edmonton once more. That was three street course Fast Sixes in a row. What that told me was that all the work we did, even with the Lotus engine, paid off. We couldn't really see it in our results with Lotus, but we could see it right away with Honda". "It's not just Honda--I mean, Honda played a really big part in all this, but it's also having the team working really hard even before we were with Honda. We also had to play catch-up with the teams that were already with Honda. It's nice. Honestly, I'm enjoying my time, we have good chemistry with the team". "It plays a pretty big part, I think. If you look at the big teams, they're all trying to be very stable and get that continuity into their program. Rocking the boat and changing the program can just extend the number of years you need to get it right. For us, to hit it right on the head so quickly, it's very unique. I've known [lead engineer] Todd [Malloy] for a long time, and I respect him, and he respects me. He trusts me, and that fact makes me feel really appreciated. Same for [BHA team owner] Bryan [Herta]--he mentioned he knew I was good and had talent, but in this situation I'm exceeding his expectations. There's no path or secret to all of this. I just think it's a combination of everything. I like Bryan, I like the team, my engineer and I were gelling immediately well together. Honestly, I can close my eyes and hear his voice about what he thinks about the car, and just a look from the car to the timing stand, he knows whether or not the car is in the ballpark. Really, it's amazing, and I hope we are able to continue with this particular trend, because it's not easy. To be in the Fast Six three times in row while playing catch-up, it's great, especially with the level of competition we have right now. I mean, we're watching the other teams head back to the garage, and it's no joke. Anyone will tell you the competition level in this Series is as high as its ever been. I'm really proud of the team, and just really, really thankful this program came together". "We have to thank Barracuda and Bowers and Wilkins for helping bring this together. I feel like I'm on the top of my game right now, and we're looking at continuing with each other for a long time. This is what I wanted for a long time in my career. Being on a time where I'm wanted, and I can really show who I am as a driver. That's what I've wanted, and that's what I have, and I'm not going to let it go". "Let me tell you something: as soon as I left Player's [Forsythe Racing], it was just so much politics. I was supposed to have a firm contract, but there were some politics involved. PT [Paul Tracy] showed up, and they talked about needing an English driver and a French driver, and everybody thought I was in a fight with PT, and then they tried some things with a 3-car team, that didn't work and I sort of paid the price through all that. I'll tell you, since then--that was 2002--this is the most stable and great environment I've had. Bryan has said they evaluated my capability as a driver back from the days of Rocketsports Racing. If you remember, that was a startup team from ChampCar with very little resources. Halfway into the championship, I was sitting third in the ChampCar standings. Then some things began to fall apart, we had some inconsistency, but through that, Bryan said even as a driver, he was sort of evaluating me. Honestly, when I started at Rocketsports, I didn't have an engineer--that came after. When do you hear of a team going racing without an engineer? It was really a lot of things like that. I guess you could say lack of resources, lack of money--startup teams needing a veteran driver. You could sort of say the same thing about Walker Racing. They were very good people, very strong environment, but they were running with Reynard, switched to Lola, and needed a veteran to work through that. Right now, it just seems like Bryan is putting all the eggs of Bryan Herta Autosport into my hands, and as a driver, you need that. You can't be feeling like you're there just because of money or because you're bringing something but won't be rewarded when the team moves up. It seemed like it happened so many times. I put all the tears and effort into Rocketsports, and suddenly, when the team is getting ready to go somewhere, in comes Timo Glock, bringing a lot of money. It felt like that was the story of my career sometimes". "I'm not saying I've not made any mistakes; I know I've made a ton of mistakes, just for the passion of racing and the love of having a steering wheel in my hands. I would be willing to do anything--take any ride, go anywhere--and you know, sometimes, if you're smart, maybe sometimes that's not what you do. Maybe instead you chill, wait until the right team tells you you can drive for them, and show you value your experience and talent. So by saying yes to anything, anytime, maybe it made me look desperate, or not as good as I was, and maybe that was the tag that was assigned to me. Now, I feel like the team is really happy and excited, I think the Honda people are happy with me. For any athlete, in any sport, I feel there's no secret. In an individual sport, you might be able to show your talents all the time, but in racing, as any team sport, it's a lot harder--you need a brilliant team around you to produce results. I think now we have it". "We still think we're far from where we should be, due to the engine switch and lack of time. The Honda switch was expensive for the team, so there's a lot of testing money that went into that side of the picture. People don't realize, but BHA is a non-Leader Circle team, so sometimes the budget managing is difficult that way. We have our challenges, we know that, but nobody is whining or complaining. Nobody is saying, 'man, we don't have money to do this'. That's why the atmosphere and chemistry is good, maybe because I can remember the rough parts of my career, so I appreciate what I have. I think the crew is thinking the same way. That's really the only thing I can come up with. I'm the same driver I've always been. The Series is more competitive than ever, and people seem surprised when we're in front of some pretty big names, but hey, we've been there before. Of course, it needs to be done consistently. But mentally, we're feeling really good, and I think we'll just continue to improve". "I think we can have a good result everywhere. At Mid-Ohio, we had a 17-lap run at the test there--and it was my first test of the year, by the way--and we had some engine issues, but the car felt good. I don't know how we improved compared to everyone else, but I thought we were right there with everyone. We can be quick at Baltimore, and the same at Sonoma. My first year at Sonoma, I'd never seen that track and qualified fourth. For Fontana, it's an oval--if you look at Indianapolis this year, in the first stint this year, we went all the way to P1 before we got caught with a glitch, pit speed penalty, and other issues that put us last, a lap down. On Indianapolis for a moment--we were a lap down and had to pass the whole freakin' field. We had to pass everyone, all the way to the Ganassi cars, unlap ourselves, and then with the number of laps remaining, we went up to P12. So really, looking at all that, I think we can be fast anywhere". "There's always the question, what will it take to transform speed into winning races? Well, there's always a bit of luck involved, but also experience. Sometimes, when you work as team, there's these little things that happen. For example, at Edmonton, if you look at teams like Andretti, Penske Ganassi, they all saved an extra set of red tires. We didn't. When we put on our last tires, they were an older set, and seemed to be damaged, and basically we didn't have the pace that we didn't have earlier in the race. So, basically, we had a mistake that really happened on Saturday, but it cost us in the last segment of the race. But do I feel bad about it? Hell, no! I mean, when you're competitive, you're quick, and have speed, that's the only thing a driver can ask for. That's I'm having so much fun right now. I'm driving a quick car. Sometimes we have issues. In Detroit, in practice, we were P20. We threw things at it, and qualified third. When you're a big team and can do all the tests and analyze your car, every decision you make is more calculated. Sometimes, our decisions might not be as calculated, or we take a chance--like Edmonton, where we thought we had a chance at the pole, so we threw another set of tires on we now know we should have saved. We're not far. If you ask me if I choose to make less mistakes but be less quick, I'd say no. When you drive a quick car in this Series, you put yourself in a better position to have good results. Through trial and error, you'll get there. If you're quick once a year, that's not enough to win. If you're quick all the time, I think that it'll happen". "I think if we'd been with Honda for the first five races, we could be in the Top 5 right now. With the points we didn't accumulate in the first few races--my God. You hear drivers say if they have one bad race, they can't recover. I'm like, 'Hey, the first four races I had DNFs'. We need to finish the last four races strong with what we have, and I think next year we'll have a totally different outlook and approach. I think right now, we feel like we're so close, and we maybe just try too hard. If you were in the championship and finished fifth in a race, you'd feel pretty good, right? But now, it's like we've been through so much, when you have the possibility of winning, you might think 'man, it slipped through our fingers'. But if you're in a championship fight, it's different at times. I really just don't think people realized how many times we were badass fast. In Edmonton, it was just shown because we were leading and had the coverage". "I don't know, man. You can tell--I'm super-excited! I don't take things for granted, and I'm very appreciative of what I have right now. I'm a happy man and a happy driver. I have everything I need to compete and do well. There's no guarantee in racing, especially in the Series we're in now, because it's freakin' tight. A tenth of a second can be a bunch of positions. But it's working for us right now, and I'm very excited about the way things are going right now. It should be good".